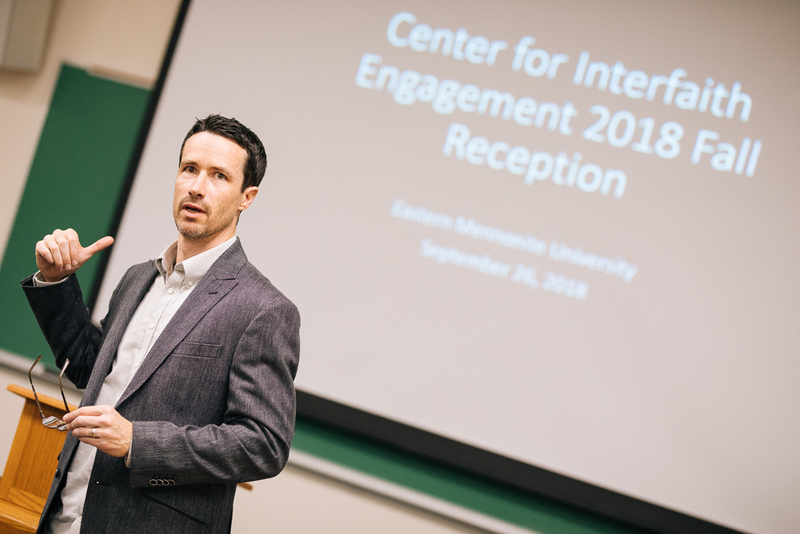 The Eastern Mennonite University Center for Interfaith Engagement (CIE) held its fall reception in September to celebrate the previous academic year and note upcoming events. In partnership with other service and learning organizations, CIE provides opportunities for interfaith education and engagement and promotes collaboration among religious and nonreligious scholars and practitioners to build a more just and peaceful world through inter-religious and intercultural understanding. Ed Martin, former CIE director, discussed a recent learning tour to Iran. At the reception, Seidel highlighted ongoing CIE priorities, which include forming an advisory council, building partnerships with each academic department at EMU, developing opportunities for interfaith experiences and relationships in the broader community, and growing its financial sustainability. 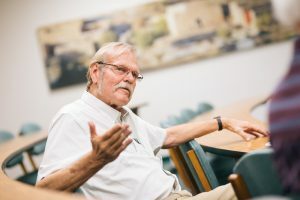 Ed Martin, former CIE director, shared about a spring 2018 learning tour to Iran – one of several he has hosted over the years. The delegation included Christian, Muslim, Jain and Zoroastrian participants. Among other accomplishments this year, CIE provided input into a new minor in interfaith studies in conjunction with EMU’s Bible, Religion and Theology Department. It provides students with opportunities to understand major faith traditions and practice relating across faith differences. Course topics include world religions, comparative monotheisms, philosophy of religion, understanding violent conflict, history of the Middle East and more. Turkish author and New York Times contributor Mustafa Akyol visited EMU to speak about his new book The Islamic Jesus: How the King of the Jews Became a Prophet of the Muslims (St. Martin’s, 2017). CIE was a sponsor of the Shia Muslim-Mennonite Christian dialogue at Canadian Mennonite University in Winnipeg, Manitoba. The seventh of its kind over the past sixteen years, this event brought together Shi’a Muslim scholars from Qom, Iran, and Mennonite scholars from Canada and the U.S. – including EMU professor Peter Dula – for presentations and discussions on the topic of religion and youth. A roundtable event, “Borders and Bridges: Reflections on Interfaith Engagement,” discussed ways that building bridges of practical interfaith collaboration in relief, development, and peacebuilding have served as strategic forms of Christian witness. CIE director Tim Seidel was selected to participate in a spring seminar on teaching interfaith understanding, organized by the Council of Independent Colleges and Interfaith Youth Core. Along with renowned peacebuilding scholar and practitioner Mohammed Abu-Nimer, Seidel co-edited The Hizmet Movement and Peacebuilding (Lexington, 2018). This new book assesses the peacebuilding implications and societal impact of the Hizmet Movement, presenting cases that provide a counter to negative stereotypes of Islam with examples of positive educational institutions rooted in Islamic values. The book includes contributions from scholars and practitioners around the world that critically explore the intersection of the movement and peacebuilding in countries such as Northern Iraq, Nigeria, Ethiopia, Kazakhstan, Kyrgyzstan, Sri Lanka, and the Philippines. In the next year, CIE will help organize the summer 2019 Interfaith Peace Camp and continue to support Mennonite Church USA’s new Mennonite Jewish Relations Work Group, said CIE associate director Trina Trotter Nussbaum.